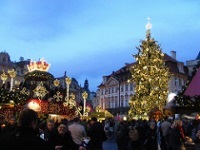 Christmas in Prague is a delightful season made special by the traditional Christmas markets that sparkle with lights and colourful decorations, resound with Christmas music, and tempt anybody nearby with the scent of hot mulled wine, sausages, and gingerbread. Brightly decorated wooden huts sell Czech handicrafts such as puppets, candles, wooden toys, and jewellery, alongside traditional food and drinks. In Old Town Square, local and international choirs and ensembles sing Christmas songs, and a wooden stable recreates the Bethlehem manger scene with live animals. Other festive attractions include an open-air ice rink and an enormous Christmas tree ablaze with colourful lights. While the winter months are far from being the peak tourist season in Prague, the festive fun and traditional charm of Prague's Christmas celebrations more than make up for the weather. They give significant motivation to travellers considering a winter holiday in the Czech Republic. As the markets are open for the whole of December, they are the perfect place to buy gifts and souvenirs, even if you aren't going to enjoy a Prague Christmas.